After making the surfaces smooth with sanders or sandpaper, a coat of primer is to be applied to the wood in the interior as well as the exterior walls of the playhouse. This will make the surfaces smoother and less paint will be required to paint the playhouse. The final step is painting. 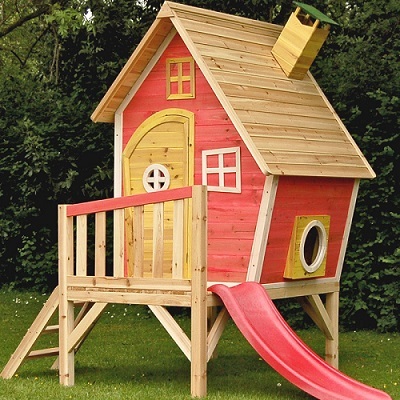 Playhouse can then be painted using the selected colours with the help of a broad paint brush preferably 4 inches in width. Consider painting the door and window frames in brighter colours such as vibrant red, blue etc. You could also make colourful drawings on the exterior walls of the playhouse such as drawing a fish tank or plants or animals. This will enhance the look of the playhouse. Apart from painting, you could also use wallpaper with floral design patterns or cosmic designs for the interior of the playhouse. This will give a dramatic effect to the interiors of the playhouse. This entry was posted by Benzu JK on May 9, 2013, 3:31 am and is filed under Design Guide. You can follow any responses to this entry through RSS 2.0.